Champion Tool Storage Flightline Series was designed to provide Aircraft Technicians with a more robust tool storage solution that is easily transported from hangar to hanger. Our 16" and 20" pneumatic wheels allow the unit to easily roll over cords, large cracks in concrete and asphalt, and even over lumber and debris. Proudly made in the USA, the Flightline Series is built to withstand the harsh conditions of the job site and to protect the tools you use every day. Our units are constructed with thick gauge welded steel housings, steel drawers, ball-bearing drawer slides, and powder coated finishes. These boxes can tolerate heavy handling and transportation using aircraft tow tugs and tractors. They allow secure storage for technician tools without having to empty the cart at night. The heavy-duty Flightline Series is flexible and maneuverable, making transport of tools and parts fast and easy. 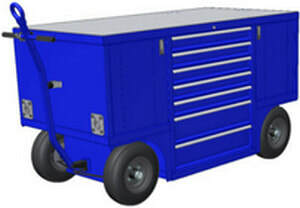 No other tool box on the market with casters can provide the versatility the Flightline Series provides. ​This is the ultimate aviation service solution! The CTS1.5PC provides tool storage, bulk and parts storage, and a 1/8" thick aluminum work top. This unit can be moved by hand or towed with a tow tug. These units can also be provided with power inlets and outlets. The CTS2PC provides tool storage, bulk and parts storage, and a 1/8" thick aluminum work top. This unit can be moved by hand or towed with a tow tug. These units can also be provided with power inlets and outlets. The CTS3TR can be utilized for many applications and includes weather tight roll up doors on each side. The interior can be built to suit with interior & exterior lighting. This is the ultimate aviation service solution.